That's going to be the title of my new book, what do you think? Well it may be a pipe dream...we'll see. I thought I would share with you my UltraLight gear for 2 weeks and 200 miles in the high Sierras. My base weight (pack weight minus consumables - food, fuel, and water) for this trip is very high for me at 9 1/2 pounds. It's about 3 pounds heavier than normal because I'm carrying gear for the heavy snow conditions this year as well as being in bear country. 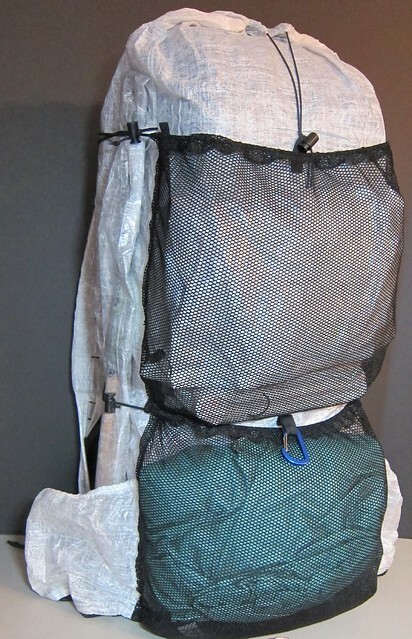 Pictured below is my 1/4" closed cell foam sleeping pad (which doubles as my pack frame), Kahtoola Micro Spikes, Tenkara USA Iwana 12' fishing rod, Simblissity bug net, Smartwool glove liners, DriDucks rain jacket, BearVault BV450 bear canister, ZPacks Hexamid Twin tent and stakes, and Trail Designs 1.3L Sidewinder stove system. 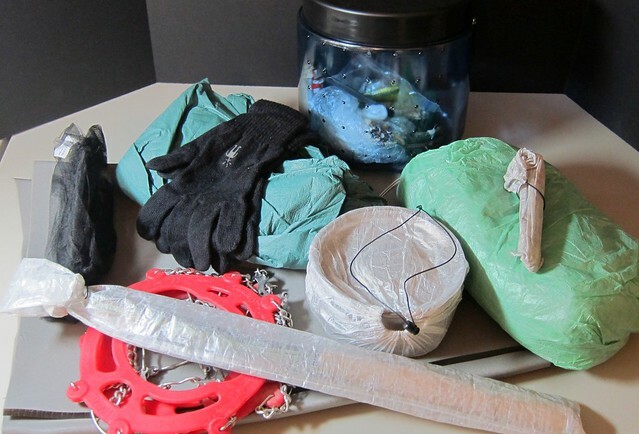 My insulation layers and extra clothing go in my home made pack first. First goes the folded sleeping pad (which you can't see in this shot), then the pack liner with the sleeping quilt, and extra clothing inside. 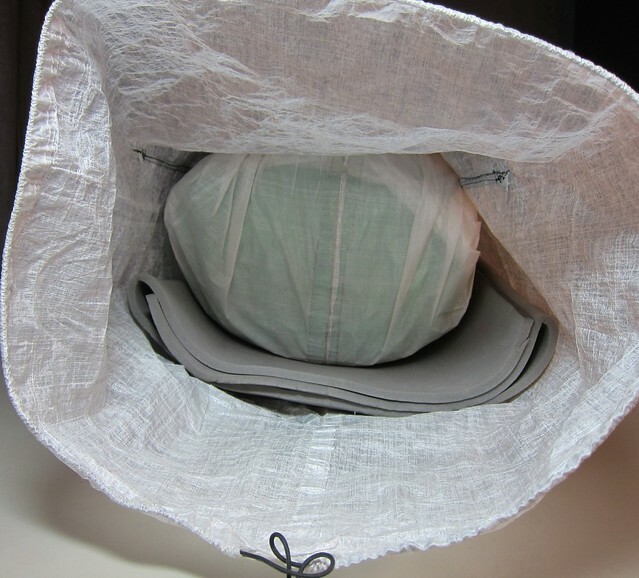 The pack liner is made from very lightweight 0.51oz (per square yard) cuben fiber, and weighs just 0.65oz total. It will puncture easily, but with a little care it will remain water tight for years. On top of that goes the stove and tent. Then simply push some of the air out and tighten the cord lock on the pack liner. No need for a heavy roll top closure, just fold the top down and you've made it rain proof. Note that the insulation layers aren't compacted all that much, which will help extend their useful life. 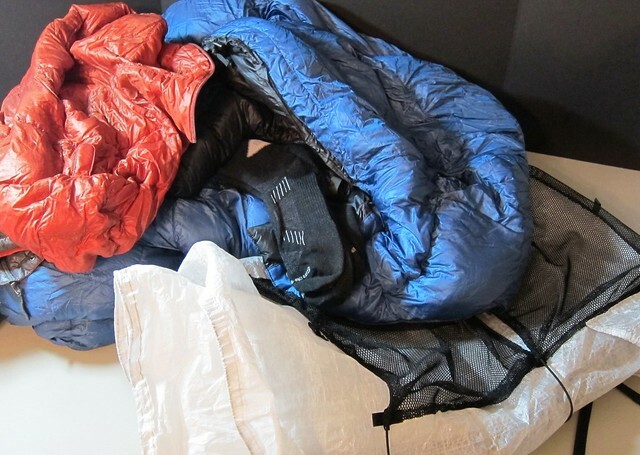 A lot of people like to roll their sleeping pad and store the contents inside, but my method adds more padding where it counts, and also helps to keep the pack flat against your back. 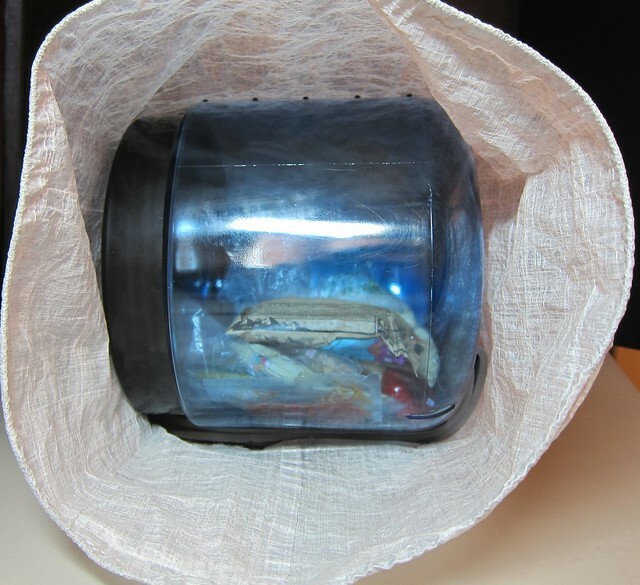 On top of the pack liner goes the bear canister (ugh, 2 pounds without food!). I will either store my micro spikes on top of the canister, or hang them on the outside of the pack if I'm going to be using them soon. 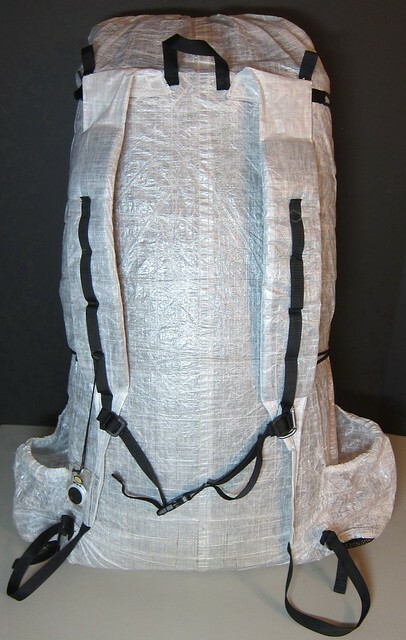 The top closure on my pack is made like a stuff sack, and the draw cord goes through a small loop above the top rear pocket to secure it. 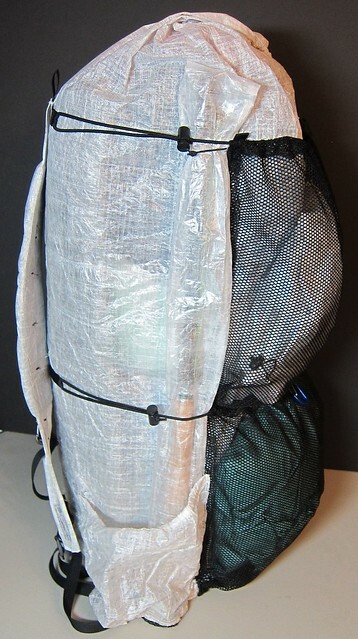 This is an idea I borrowed from ZPacks, although I think he does it a bit differently now (thanks Joe!). The pack is not waterproof because there are probably a thousand little holes from sewing it together. That said, I have hiked all day in rain and snow and had the inside of the pack stay dry. The pack liner is a nice bit of insurance though. I like to store items I may need throughout the day in the outside pockets, and my two pocket pack design helps me keep things very organized. 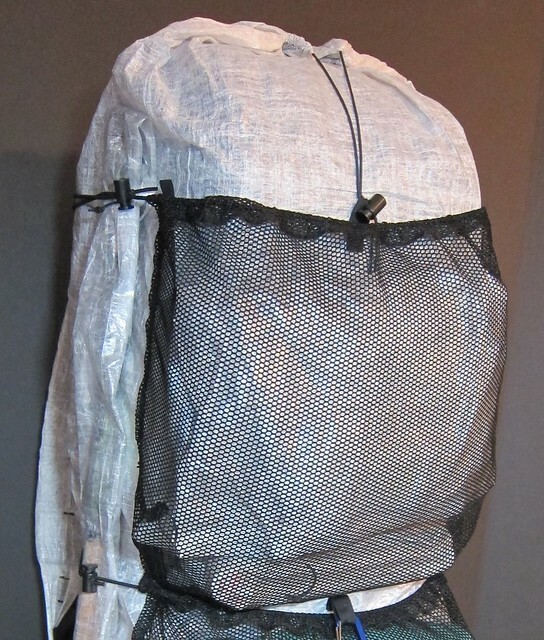 In the bottom outside pocket I put the bug net, then the rain jacket with the glove liners just behind it. This makes it so I can reach the glove liners without stopping. It's amazing how quickly you can warm up just by putting on a pair of gloves. 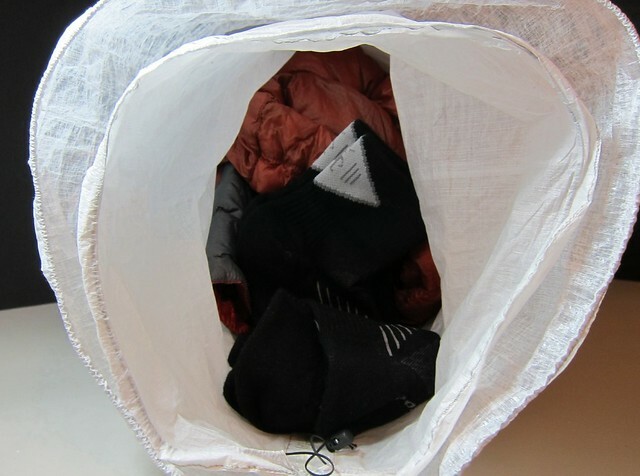 I made a large dry sack to store my essentials in. 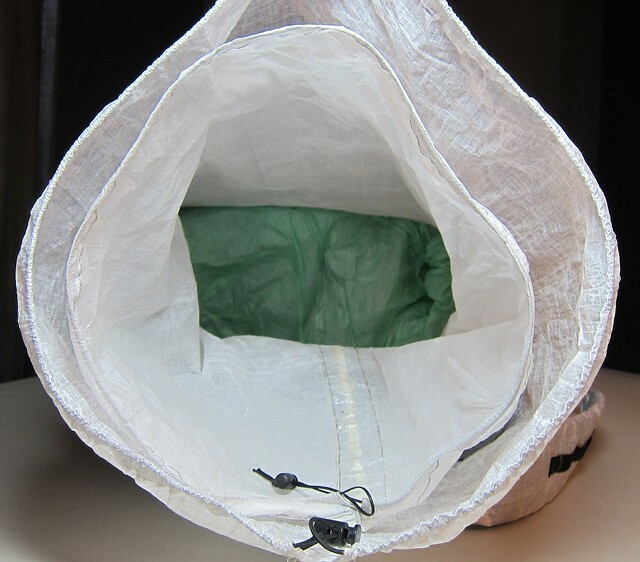 I used to use the same really lightweight cuben material my pack liner is made from, but I've found that it's just not durable enough for this application. Now I use the same material I do for making backpacks. 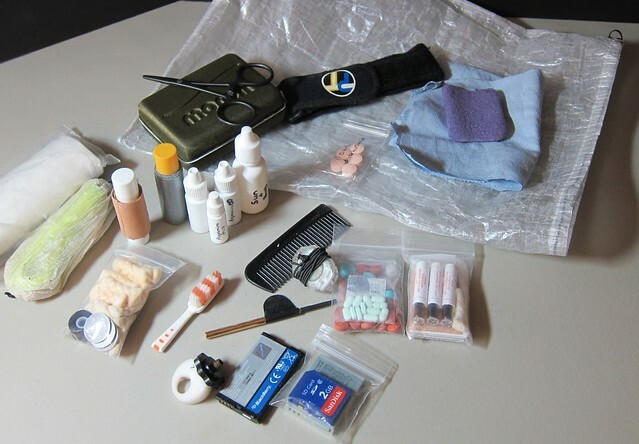 Included is everything from fishing gear to water treatment to medicines to electronics to maps. All in one great big sack that I have seam sealed. The tent stakes and essentials go in the top outside pocket. One of the large snow stakes doubles as a potty trowel, so I keep the stakes withing easy reach. 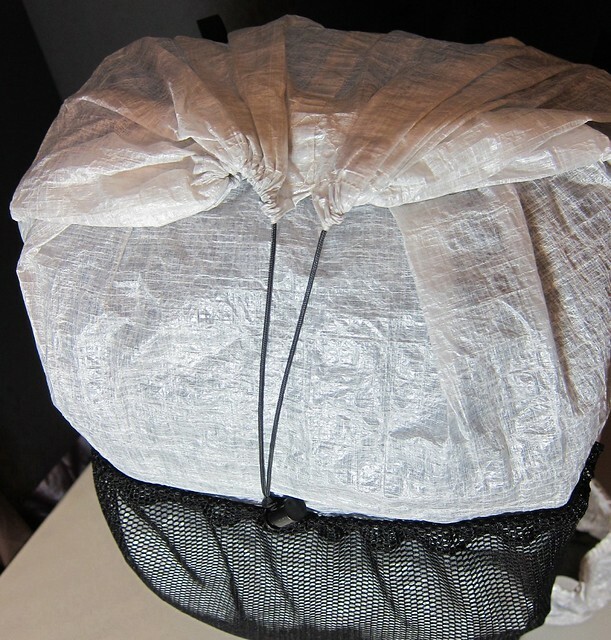 I simply fold the top of the essentials dry sack over to make it rain proof, which is why it's extra tall. 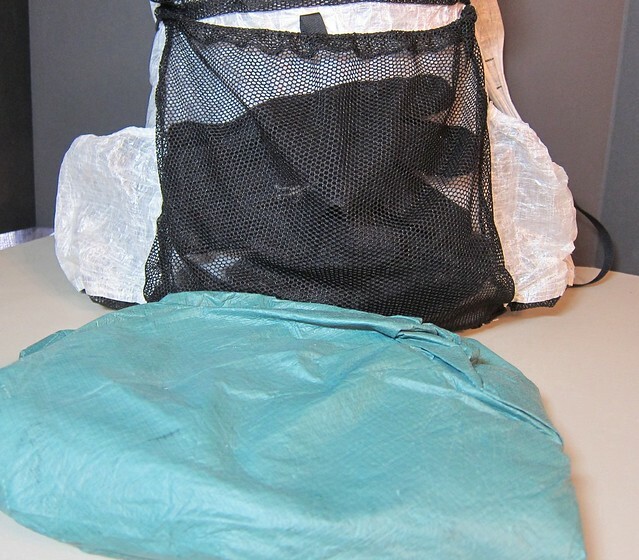 Again, no need for a heavy roll top closure, although if you think you might go swimming, say during a stream crossing, you can close it similar to a roll top closure as well. My backpack is on the large side relative to its contents so it doesn't have to be over-stuffed. This makes the pack ride flat against your back rather than like a big cylinder flopping around. You might also notice I don't use a hip belt, which I find restricting and unnecessary with a light comfortable pack. In fact I only use the sternum strap about half the time. My Tenkara fishing rod stores in an outside pocket secured by shock cords, and protected by a sleeve I made from the same material as the backpack. I'm ready for a stream or lake at a moments notice. Tighten up the side cord locks to add some horizontal compression and also snug the tops of the outside rear pockets. Packed and ready to go. I'll only carry one quart water bottle in the Sierras because water is so plentiful. Carrying less water makes up for some of the additional heavyweight gear I don't normally carry. Gear List - here's how it all stacks up. John, I've been interested in making my own backpack. I've been trying to find a good design online but haven't found one that I think I would like. How do you like yours? Did you copy another design or make your own? And lastly, where could I find a design like yours/do you have directions/specs on how you made yours? I made my pack about 15 months ago and have used it exclusively ever since. I have around 500 miles on it and it's holding up very well. The design is my own, with ideas I came up with along with some borrowed from others I have seen. I made a new one recently for my son and took lots of photos for an upcoming (how to make your own) post. I hope to get the post published in the next few weeks, so stay tuned!